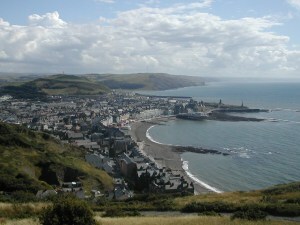 Today I have moved to Aberystwyth to start my new life as a student at Aberystwyth University. I’m glad I finally got to move today, I was so very bored with packing! The drive this morning to Aberystwyth was absolutely beautiful, the sun was shining as we travelled through the mountains (I’m using the word mountains, I’m not 100% sure whether they’re hills or mountains but they’re huge and impressive in any case). The route we would normally take was blocked so we had to drive via the interestingly named Devil’s Bridge. Whilst the road was at times mildly hair raising the views we saw completely made up for it, there are waterfalls there that I’m sure I shall have to visit at some point. Moving into halls was far more straightforward than I remembered it being in my previous university experience. I’m on a “ground” floor which is actually ground floor on one side of the corridor and third floor on the other (yes, Aberystwyth is very hilly). I’ve been put in a flat with other mature and returning students which has been a huge weight off my shoulders. I had been a little concerned about being with loads of Freshers straight out of sixth form who wanted to party all night, every night, so it’s been a nice surprise. My room is very standard halls of residence. It’s a bit bigger than I was expecting, and in pretty good condition. Now that I’ve got all my own things in it I’m feeling pretty settled already. I’m only one room away from the kitchen which will be great for making all of those mugs of tea! Previous Post Finished Object : Parachute Regiment Badge. Next Post Reading Record : September 2010. Yes, I haven’t made it up to there to take my own pictures but I’m really looking forward to doing so. And thank you.